These two photographs were given recently to Brian Hayes, our chairman, on a visit to a meeting of the Caledonian Railway Association. They appear to show three engines being prepared for exhibition somewhere. Where are the engines being prepared? ie what and where is the building they are in? What was the occasion/exhibition for which they are being prepared? The location is almost certainly the Paint shop in Crewe Works. The profusion of low hung electric lighting gives the clue that no heavy lifting or erecting took place there and that good lighting was a requirement.The reflection on 'Cornwall's' dome gives the impression that thjs building was of a 'northlight' contruction which would fit my Paint shop suggestion. The occassion is more difficult to assess. My own thoughts are that they are being prepared for the Festival of Britain in 1951 but I have not been able to find a list of the railway exhibits. 'Coppernob' was not normally a resident of the Paint shop, so was obviously en-route to somewhere,being mounted on a low truck. The workman and his garb, attending to 'Coppernob' gives the impression that the photo was taken in the early 1950s. I do remember that just prior to the Festival of Britain, one of the latest 'Britannia' class, ''William Shakespeare' I think, was specially painted and prepared for exhibition at the South Bank and the paint shop was opened up to Crewe residents for a few evenings to view it, and we as a family went along to this event, but I am afraid I was too young to notice what else was there. Two additional photos from Ted Talbot are present on the 'larger image page'. They were taken from inside the paint shop. They suggest that the other photos were taken at a different location. 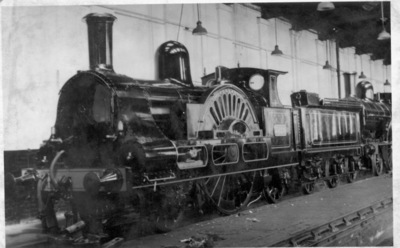 I see in the background of the picture of Columbine that there appears to be an MM class 2-8-0. An unusual shed mate? I think the pictures of the historic locos were taken at Carlisle Kingmoor. 1958 was the 800 anniversary of the City and there was an exhibition of historic locomotives in Carlisle Citadel station in the summer of that year. The Queen and Prince Philip also made official visits in 1958 arriving in the Royal train. I attach a further picture taken at Kingmoor on the 22nd June 1958 showing Hardwicke, to the left appears to be the trolley wagon with FR No.3 loaded on it. A search of the web produced this :- http://www.railbrit.co.uk/imageenlarge/imagecomplete.php?id=30095 Additional photo added to 'larger image' page.